Let’s call the Chase for the Sprint Cup what it is: a playoff. When you’re closing out the season, that’s the worst time to start enforcing rules more strictly. After an unusually strict restart penalty, Brad Keselowski called NASCAR “an entertainment sport” as opposed to a “fair” one, questioning NASCAR’s credibility over their change in enforcement. NASCAR saw that Brad had jumped the start, but many fans didn’t really see anything worth penalizing. It looks as if Greg Biffle didn’t want to get on the gas in the restart zone, and Keselowski did. While Keselowski was supposed to stay behind Biffle in the restart zone, Keselowski also immediately gave the place he gained back as Biffle finally sped up. Isn’t the point of restart rules to ensure that everyone restarts in the same order? Why was there a need for a black flag on top of that? Keselowski was later black flagged for the offense, which baffled many people in the NASCAR-verse. Huh? How? And why are the restart rules only getting enforced this strictly this late in the season? Even Greg Biffle admitted to ESPN that he felt bad that Keselowski received a penalty for the restart. Biffle hadn’t been paying a lot of attention to Keselowski’s car, but was focused on making a smooth start when he was ready. “I didn’t go right at the [start of the zone], but I maintained my speed and I didn’t speed up or slow down and I took off when I felt like it was time for me to go,” Biffle explained to ESPN. As far as the stricter interpretation of the restart rules goes, did the Penske team accidentally shoot themselves in the foot on this? Let’s look back at an incident right before the Chase for the Sprint Cup began. Richmond is one of those interesting places that the restart zone, it’s on the wall and it’s on the inside wall and it’s still in the corner. On the inside it’s here and on the outside it’s there. I was looking at the inside wall, and I probably went a few feet before the inside mark. But it was right in the vicinity. I just got rolling a little bit toward it, really. It’s not like I jabbed the gas and left him 20 car lengths. I feel like the other night the line got pushed a little bit, and it was OK. I think that will kind of show in the future where guys are going to go with these restarts. … Until we get clarity, we’ll keep pushing it more and more; you almost have to protect us from ourselves because we’ll take it to the extreme. NASCAR originally maintained that they wanted to leave as much of the responsibility of doing restarts properly up to the drivers after Richmond, but cracked down on it for last weekend’s race at New Hampshire. ESPN reports that NASCAR introduced cameras focused on the restart zone and a senior official stationed by the zone to watch restarts at NHMS. NASCAR used both the official’s account as well as the cameras to review Keselowski’s restart. 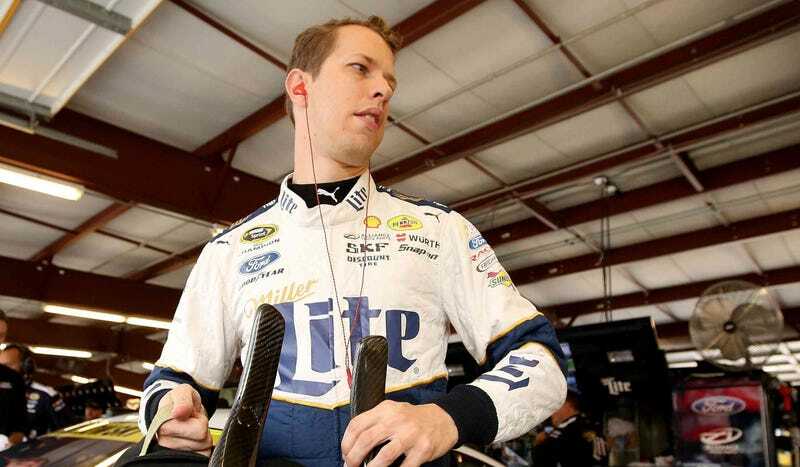 Needless to say, Keselowski isn’t happy about being the first one nailed under the new emphasis on restart etiquette. “It’s a pretty basic understanding that it’s an entertainment sport, not a fair sport, but you know, we had a great car,” Keselowski said this in his post-race remarks to NASCAR. Emphasis ours. “I got the chance to do something again for the first time — the first person to ever be penalized for jumping a restart when I didn’t pass anyone, so that’s a new one,” Keselowski told ESPN of the penalty. Kenseth, of course, maintains that there’s never been any ambiguity as to what the rules are regarding restarts. If they start enforcing that and making sure the leader has the advantage, then you’re not going to have the issue any more. In my opinion, you have to make sure the leader is taken care of. I think the leader should always have the advantage, He earned that. He is the leader. He should always restart the race. The rule they changed about a year and a half ago is that the leader has to restart the race in that box and the leader has to be the first one out of that box. In other words, he likely agrees with NASCAR: Greg Biffle should have taken the lead at New Hampshire, and it was up to Keselowski to wait for him to get going until they were clear of the restart box. The leader is the control car. The leader has earned the right to restart the race in the restart zone. ... We’re not out to get anybody, but we’re the keeper of the rules and the enforcer of the rules. All anybody asks for in this garage area is to be treated fairly and we believe we did our job today. “Fairly.” There’s the tricky word. “Fairly” implies that the hammer would’ve been dropped on restarts several other times this season, but it hasn’t been. NASCAR got part of this right: they let competitors know beforehand that there would be a crackdown at New Hampshire on jumped starts. That’s great! However, the lack of enforcement all season long isn’t so great. If it’s going to be consistent from here on out, great! But really, consistency in enforcement is key. Otherwise, dudes who get penalized after several questionable restarts in the season go without question are going to raise quite a bit of a stink as to the credibility of your racing series.